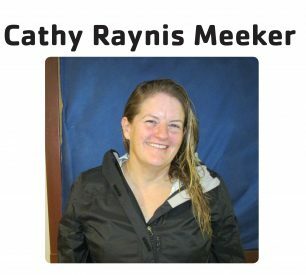 Home Blog Rye Y Story Project-2017 RYE Y STORY PROJECT: CATHY M.
RYE Y STORY PROJECT: CATHY M.
Twenty years ago, I joined the Rye Y and tried to get back into swimming, but work got in the way. I had a demanding career and devoted all my time to it. I swam in college for the University of New Mexico but then took a 25-30 year break. I got so focused on my career that I forgot all about swimming. Several years later, my husband Mark brought home a flyer from the Rye Y about this new opportunity for women to start doing triathlons. This group, later named the Rye Y Tribe, was a triathlon group exclusively for women and it helped me change my priorities from working all of the time to finally taking care of myself. So I came back to the Y about five years ago and joined the Rye Y Tribe. It was a wake-up call. I was out of shape, had put on 50 pounds, and swimming even a short distance left me out of breath. Initially, I tried swimming on my own because it was hard to make it to the group swims. But I wasn’t doing what I needed and wasn’t making myself a priority. I needed a coach, peers, and a community to work with. I couldn’t do it on my own. I started doing the early morning endurance swim class where I swam with triathletes from both the Tribe and the Rye Y Tri Club. Two years ago, I started swimming with the Masters group at 5:30 a.m. I started working on alignment and strength training, too. All of these groups have loving, caring people who are gracious with their time and knowledge. The more I came to the Y, the more I got in shape, the more friends I made, and the happier I became. The people and coaches from both groups shared their wisdom, their wetsuits, their watches, and started inviting me to all sorts of bike rides, runs, swims, hikes, yoga days, socials, and triathlons. With the endurance swim class, the masters swim group and these two tri communities, I learned to bike, run, and swim again. I got off the couch and did my first triathlon. At 55, I have now completed two Half Ironman races (1.1 mile swim, 56 mile bike, 13.1 run)! I am so grateful for all of those who have encouraged me and made it possible for me to try triathlons. I still have a career but my life is in balance: I am off the couch, stronger, more fit, happier, and have a life full of lovely people. The biggest gift of joining the Rye Y, the Rye Y Tribe, and the Rye Tri group, was that I re- discovered that I had something to offer others, especially those who were the most nervous about swimming in pools or open water. Mark and I now help swimmers of both triathlon groups to be more comfortable and efficient in the water. Some friends even call me the swim whisperer. Many people I have met at the Y have helped me learn to function on land (biking, running, core and strength training) so it is so nice to give back and help others. All the people I teach in my “Pre-endurance” swim class, private lessons, all the people I workout with, and the people I meet in the locker room become pretty special to me too. The Rye Y has become a place where I laugh, get stronger inside and out, and catch up with fabulous friends. It’s my second home.